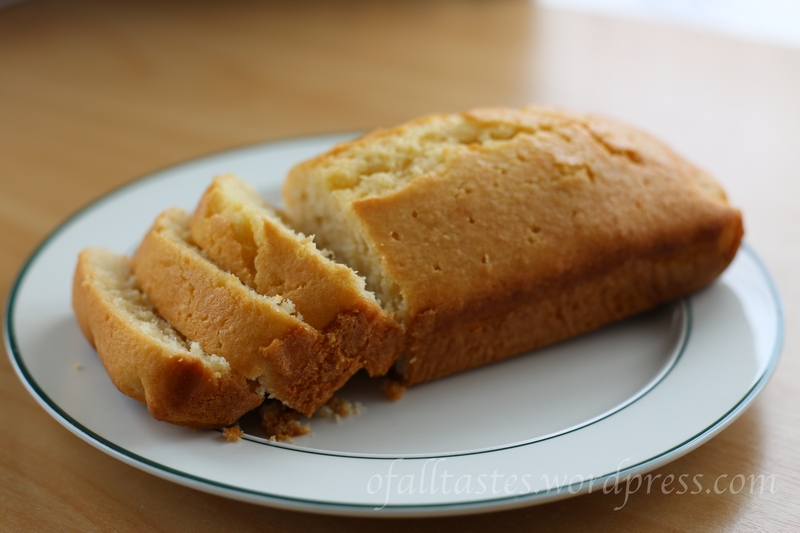 A couple of months ago I made lemon syrup cake following a recipe by Nigella Lawson: this blog presents this recipe in a really pretty, pictorial and easy-to-follow way. The cake turned out really good and I felt that it would taste just as good with some coconut in it. The flavour of the cake begged for coconut to be added and you didn’t have to try very hard to almost taste that coconut flavour. Google gave me several recipes for coconut cake and lemon coconut cake. This coconut cake looks amazing but it requires way too much effort for me today. Being in the condition I am today – cold and sleepy – I didn’t really want to go out shopping for ingredients or have to make anything too complicated. I will endeavour to try it another time when I’m feeling more energetic! The method I followed was the same as the original recipe, I just sifted the coconut in with the flour and salt. The cake did crack on top but I’m not too bothered by this since the rest of the it cooked really nicely. For the lemon syrup, I started heating the lemon juice up in a pan and I put about half a tablespoon of icing sugar in before I had a mini epiphany and said to myself, why not use honey instead? So, I ditched the rest of the sugar and melted in about 1.5 tablespoons of honey. I honestly don’t think you can taste the difference but it works all the same. Ever have cravings for cake but you’re just having one of those days? This is the recipe for you! I celebrated Mother’s Day yesterday because of a number of inconveniences with Sundays and I tried out my first lemon syrup cake. Thank goodness it was an easy recipe. By the time I got around to making the cake, I had already spent the majority of my day making ribs and I wanted to get the cake in the oven while we were all eating dinner. My dad made sweet and sour fish and along with the ribs, I didn’t want it all to go cold. So on I rushed with the cake – so rushed in fact that I didn’t bother letting the butter soften and tried to cream it with the sugar while it was still rock solid. Add eggs to that and cue lumpy mixture that looked like vomit. With the help of my boyfriend, I very quickly whipped up a second mixture and popped that into the oven. The recipe I used wasn’t the one I posted in my previous post but it’s pretty similar. You can find it here. The result? Pretty decent – my mum really enjoyed it, which is the main thing. It did lack something which I can’t quite put my finger on and which was definitely present in the cake I tried that inspired me to bake a lemon cake in the first place. However, it turned out really light, fluffy and moist. Funnily, it was the kind of texture I had spent so long trying to perfect in my sponge cake attempts – and which I failed to achieve. I think it’s because I used self-raising flour in this lemon cake recipe whereas I tried to be clever and make my own cake flour with the sponge cake recipes. Sometimes it really is simple that’s best. Lemon isn’t usually a flavour I feel any particular tenderness towards, however last week on my last day interning at the local community newspaper, I had the privilege of trying an amazing home-made lemon syrup cake. It was just a bit sweet, tangy and incredibly moist – yum! Unfortunately I didn’t manage to get the recipe but have found a few online. I plan to try it out for my mum on Mother’s Day, based on the following recipe here. It looks simple enough but aside from the carrot cake I made a while ago, I’ve yet to really succeed in making a nice moist, fluffy cake. Does anyone have any tried and true recipes or suggestions for a lemon cake?